The summer track & field season is here and Coach O has everything you need to ensure it’s a great one. This includes an experienced online registration system, huge collection of equipment, exciting contests and much more! Read our newsletters or visit www.coacho.com to view all we have to offer. Coach O Registration has been simplifying the labor intensive meet entry process for over 15 years. Each year nearly 1,000 event organizers trust Coach O to handle data entry, communicate important event details and post results. The setup process is easy. We have experience in all types of competitions including youth, collegiate, masters and sports camps & clinics. Our fees are competitive and we have a reputation for offering the best customer support in the business. Visit our online registration information page or contact coacho@coacho.com for complete details. Coach O is your one-stop-shop for all your track & field needs. We work with several companies to bring you a full line of equipment and streamline the ordering process. Visit our track equipment page and place an order now. 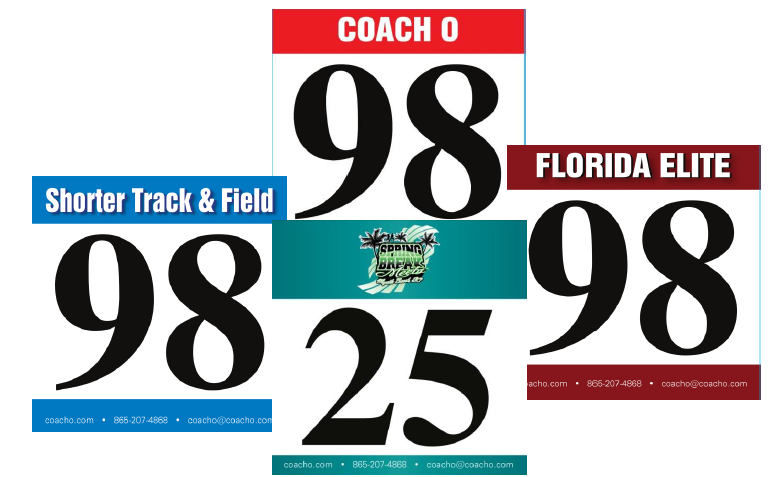 Now there's another creative way to brand your event with customized hip numbers provided exclusively thru Coach O. They offer a subtle and tasteful way to incorporate event logos, sponsor information or social media handles. And just like bibs numbers, these unique pieces can serve as special memorabilia items for athletes! Click here for more information and to place an order today! Your youth athlete had an amazing season and you want to see how their performances stack up across the country. You spend hours on the internet scouring results and creating lists. This year, Coach O has done the work for you and placed all the AAU National results in a central location! Rankings are available for all of 2015 and the 2016 indoor season. You can filter by athlete or team and customize the display to return up to the top 100 in each event. Visit the AAU Rankings and use the list as confirmation, or motivation for the future! In honor of the 2016 Olympic year, Coach O wants to encourage youth track & field athletes to "Go4Gold" in competition. Going for Gold means more than just winning first place, it symbolizes youth athletes doing their best and never giving up. Whether it's taking first place in a competition, earning a personal or season's best, conquering a new skill, overcoming injury or achieving a new fitness goal - remember to "Go4Gold" throughout this competition season. Visit www.coacho.com/go4gold to learn how to participate in the campaign and to see all the exciting images we capture! Plus several lucky participants will receive a special Coach O gift bag at the end of the summer. It’s time for the annual Coach O Father’s day Photo Contest! We realize the impact fathers or coaches have on the lives of young children and youth athletes. Youth track and field athletes are afforded many opportunities because of the selflessness and devotion shown to them by these important role models. Submission deadline: Sunday, June 19, 2016 at midnight ET (Father’s Day).